I have a huge favour/request to ask of this community. I have a section of my garden which today is just plain grass and my intentions were to buy gravel and make a japanese inspired stone area with an abundance of japanese maples. Would it be too much to ask if I took some photos of the area after work today and posted them on these forums? I obviously want an as genuine feel to it as possible and am scared senseless of screwing it up. After all, I've come to believe that members of this forum know what theyre talking about and also given me an impression of being very helpful. I've now photographed and measured the area. 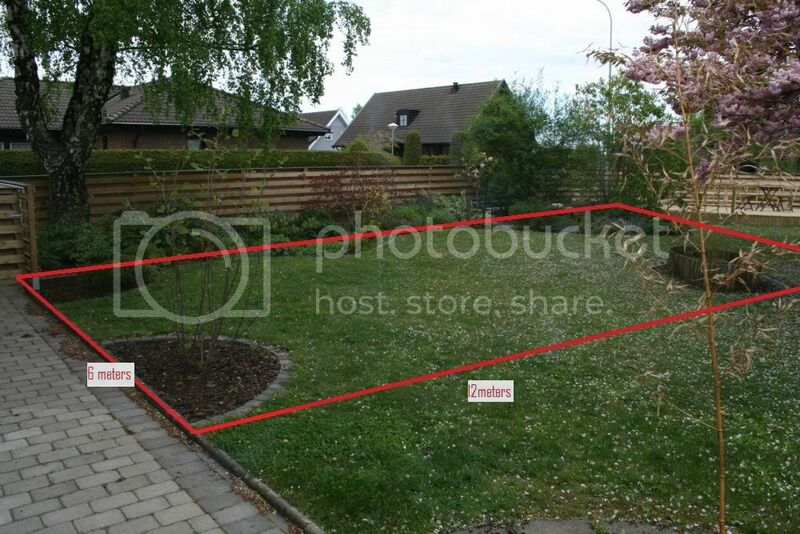 The first picture shows the measurements and the second shows where my key plants are placed just now. Anyone up for a good challenge? My most humble gratitude for all efforts/tips/ideas. Thank you. Sorry no photos are displayed. Try again Richard. Oh dear. Looked just fine after i uploaded it. I'll use another photo sharing service. Does that look better for you all? Richard I am not sure I understand what type of garden you are after. When you say a bunch of gravel and maples with a Japanese feel, it really doesn't give us an idea of what you are looking for. Perhaps you could find a photo on the Internet of the type of feeling you are after and share that. Do you want raked gravel and boulders and have the maples for a background, or gravel pathways that curve through the space and maples planted randomly like a forest or ? I truly appreciate the interest you've shown June and understandably my first description might have been vague at its best. I was thinking racked gravel with islands of green (moss) and rocks. I would need to remove the grass and my thoughts were to use this grass as some sort of elevation around the gravel area. I would also need some sort of barrier to keep the 4 and 1 year old kids from making it their personal sandbox. By all means you are all free to use the pictures I've uploaded and sketch on and post. I did find a nice picture though i didnt want to post it here as i do not have the websites permission but i can paste the link for you. The Pinus Thunbergii i labeled out on my picture has still to grow and become a niwaki as it was just planted last year from seeds picked from Japan and today i came home with 6 new different japanese maples! here is the coloration of the maple types i purchased and am looking to recreate. Your picture link is from Komyozenji Daizaifu temple outside of Fukuoka. My wife is from Kyushu and we visited family last year. I tried to visit the garden but, A monk had passed away and the temple was closed to visitors. If you search under the name you should be able to find additional pics. It was an inspiration for me as well. Richard, if you follow the example of those photos, you are on your way to a good Japanese garden. Richard, Love the photos, and we can see what you are trying to achieve. You now have your blueprint and there is no reason to be afraid of starting your project. Study the shapes of the Island of moss and the outer edge of the gravel in the photo. Pay attention to the shapes you see, lay out your edges with a hose or something similar and decide how that should take shape before starting. I like the idea of having the outer edge raised slightly and a good use for the sod you remove, I am just not sure about drainage. If elevated too much it may make a mess of your raked gravel area. Study stone placements and research that before placing your boulders in your raked gravel area. I think you are well on your way to a beautiful garden. 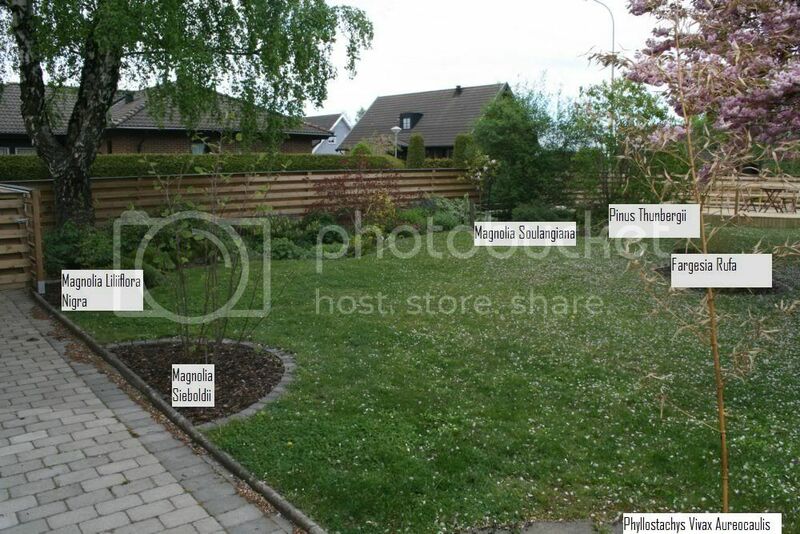 The photo's of how you would like to see your maples look is very similar to one of our members gardens. I hope he recognizes the similarities and gives advice on how he achieved his beautiful woodland garden. What planting Zone are you in? Richard, I just wanted to add some info that may help you. When the time comes to choose gravel and if it is within your budget, see if you can locate "Turkey grit" It is granite stone used by poultry farmers that has been chipped into small pieces. It will hold the raked patterns and won't lose it's color. I have used it on my front yard in a small area and plan to use a lot more in the back yard once my dry stream is structured. The color, size and texture of the gravel you choose may however depend on the type of stone you have avaliable. Other on the forum can guide you with such information. Also wanted to advise. You only want Turkey grit that is from Granite. reason being it is also sold as limestone or oyster shell. I have heard horror stories about the smell of the oyster shell grit. :'. So try to locate a poultry or animal feed store source. If you try to buy from a small garden center or bonsai nursery etc. you will be paying too much. Anyway you have time to work on all that as you progress. wow, all the replies! a big thank you! in sweden i live in zone 1 which is the mildest for sweden so im blessed with being able to plant most things apart from some bamboo's. I did a cross reference on the web and in your zone scale it shows up as Zone 7 to 8. Ive become friends with the local sand/gravel/stone companies around where i live and the prices as you mentioned vary alot. I would never consider bauying 25kg bags from a store, their prices would ruin me. for 1 ton of gravel i pay approximately $10 and thats their overall price for everything they sell. So if id prefer i could get a 1 ton rock the the same price. a question however that has arisen is the type of gravel that is available in my area. its dark??? ive read and understood the reasons for using a lightly colored gravel but never seen any gardens using the darker types. is this acceptable? gotta rush, my wifes mother needs help in her garden. I dont know why darker gravel wouldn't be acceptable if that is what you wish to use and if it offers the contrast you want. The horizontal plane it provides would still be the same. You would not have the glare problem some find themselves with. The important thing Patch is saying is don't use round gravel. You need it to have angular shapes that hold the pattern of the rake (if that is your goal). great don, thank you. yes my most trusty supplier of stone only has rounded "sea stone" which also varies in color from reds, whites, greys blacks but they dont sell the colors seperately. the type im talking about is the one found on the cover of a book called "japanese gardens in a weekend" and im staying away from that. I have however found another supplier which roughly translated from swedish is "crushed mountain rock" so ill be using that instead. Richard you should have great luck with your maples in your zone as long as you have good drainage. I am looking forward to your progress through shared photos.